Sarkar 3 is an Upcoming Bollywood Film in 2017, It is Political, Crime, Thriller film and Amitabh Bachchan, Yami Gautam in lead roles. This film is Directed by Ram Gopal Varma and Produced by Parag Sanghvi. It is made under the banner of Eros International Films. Sarkar 3 is scheduled to release on 7 April 2017. 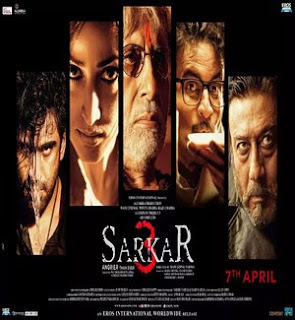 Ram Gopal Verma in 2009 stated that he had no plans finalised for the third instalment in series and shelved Sarkar 3. However in 2012 it was reported that the sequel would go ahead once again and currently is in pre production stage where the script is being written. The movie is expected to go on floors at the end of 2013.